Men’s Firenza Banquet Vest – One of our best-selling uniform vests, this sophisticated selection is ideal for banquet uniforms. It features a V-neck style, as well as a contemporary square bottom, as well as two functional welt pockets. 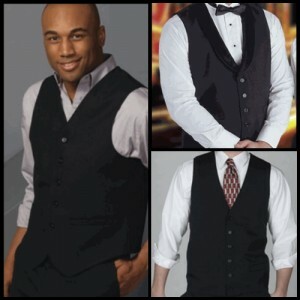 Men’s High Button Poly/Wool Vest – Running a five-star restaurant means that you need great uniforms for your staff. This high button vest is made from wool, giving you that full bodied look that polyester vests just can’t achieve. Men’s Satin Shawl Lapel Vest – When you want to dress your staff in banquet vests without the need for a jacket, this option fits the bill. This is one of our most elegant and versatile vests! Don’t let those waiters and servers go another day without one of these great uniform vests. Sharper Uniforms has dozens of options available for your male waitstaff, in addition to excellent selections for women!